Saucing it up for #SundaySupper!! Happy Sunday everyone!! 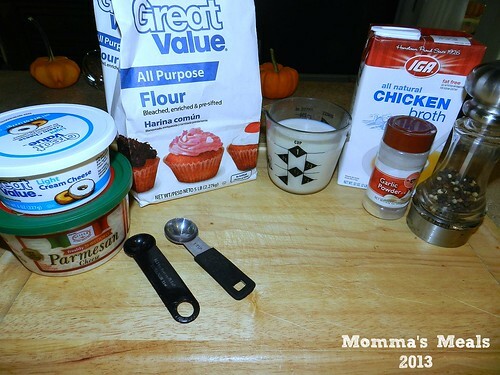 When I read what the theme was for this weeks #SundaySupper I jumped up and down and did a dance…….Yes I did, really!! My new favorite thing is making my own sauces, gravies and dressings, it’s just so easy, they always taste better and usually they are way more healthier for you too!! I’m totally going to be going back to this list a lot in the future. There are Savory Sauces, Sweet Sauces, Sauces for your main dish and even sauces for your dessert!! This weeks even is being hosted by Crazy Foodie Stunts. Love that name don’t you! So grab a cup of coffee, or drink of choice, pull up a chair and get pinning these gorgeous homemade Sauces! Your going to love what I prepared for you today because, well who doesn’t love Chicken Broccoli Ziti when we are out at our favorite restaurant? I do I do!! But I quickly pass it and move on to the next dish. Yes I move onto the next dish when this is being offered at a family function or buffet line. I even pass by it on a menu when I’ve decided to Splurge and and say the heck with it………….Well no more passing by this dish because I made a version that is WAY MORE healthier and I added whole wheat pasta to make this dish complete! Who would have known that a healthier version could be made and that I could actually make it!! I don’t know why sauces, gravies and dressings intimidate me, every time I attempt one I actually love it!! This one is no different. My husband and I recently had a weekend away from the kiddo’s (I know we are crazy lucky and yes that picture above is from that very weekend!) I wanted to prepare my MIL with a dish so she didn’t have to worry about feeding herself or my picky daughter. I also had left over ham from a ham dinner my mom had cooked earlier that week (love when mom sends me home with the leftovers!) This dish was super easy and I had some before I left…….YUMMY, I’m not sure I’ll ever by jarred sauce again!! Next time I’m making double and freezing some! As I did a search for a lighter version on the internet, I figured out that the ingredients were all pretty much the same so I kind of just went with it and made up my own, this is what I came up with!! Soooo good, sorry, I love pepper so you can calm down on it if you want! In med. 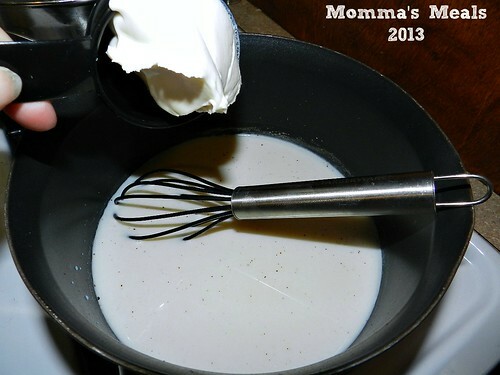 saucepan, whisk the milk and cornstarch until smooth. Whisk in the broth and place over low heat. Add the cream cheese, garlic powder and most of the pepper. Bring to a simmer and cook until the sauce thickens, this will be about 5 minutes. 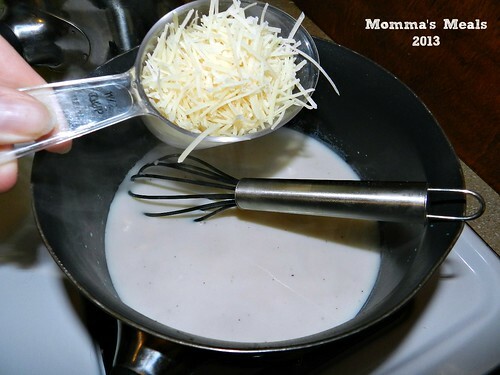 Whisk in half of the parmasen cheese and stir until melted. Add the rest of the pepper and parmasen cheese and whisk until melted about another 1 to 2 minutes more. The pasta dish I made (leftover ham cut up and a cup of peas) served 4-6 people. Easy, quick and healthy week night dinner right here! Hey make it ahead of time so all you have to do is boil the pasta and throw it together! Hmmmm I’m on to something! I love that you lightened it up. It’s so hard to lighten Alfredo sauce. It’s perfect! What a great recipe! So much better than the regular heavy Alfredo Sauce. Thanks for sharing! Your sauce looks so good, I have to try it. Thanks for a great recipe!! I adore Alfredo sauce so thank you so much for giving me a recipe I won’t feel guilty making!! I love it when you say guiltless Alfredo sauce. 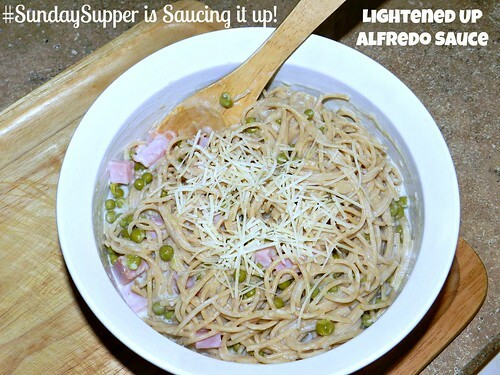 Love that you lightened up the alfredo! It’s one of my favorite sauces but it’s so fattening. Can’t wait to try this! …and to think I’ve been using the heavier version of alfredo (butter, cream, cheese) all this time. This is a great alternative and thank you for participating this week. 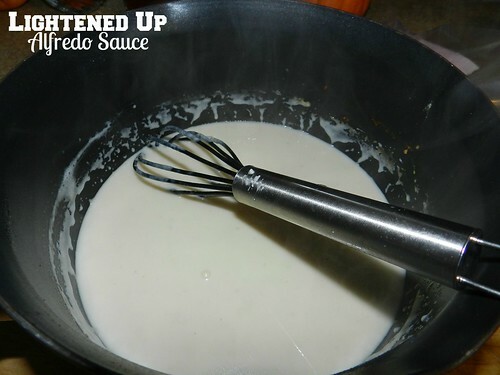 I’m delighted to have a lightened up version of my favorite Alfredo sauce. It sounds fabulous! Love that you made this a lighter version of alfredo! Alfredo sauce is a favorite in our house and yours sounds so good! Guiltless Alfredo Sauce?? Sign me up! I love alfredo but don’t eat a ton and haven’t mastered making it at home! Fettuccine alfredo has always been one of my favorite dishes. I often make it with cauliflower so it’s healthier, but this sounds like a great alternative! 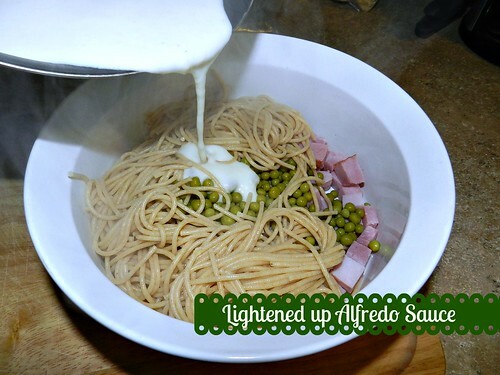 What a perfect light Alfredo sauce! Yum!!! Thank you for making a lightened alfredo sauce! It’s my favourite sauce over pasta but I never make it and rarely order it out because of the calorie count. I can’t wait to try this!